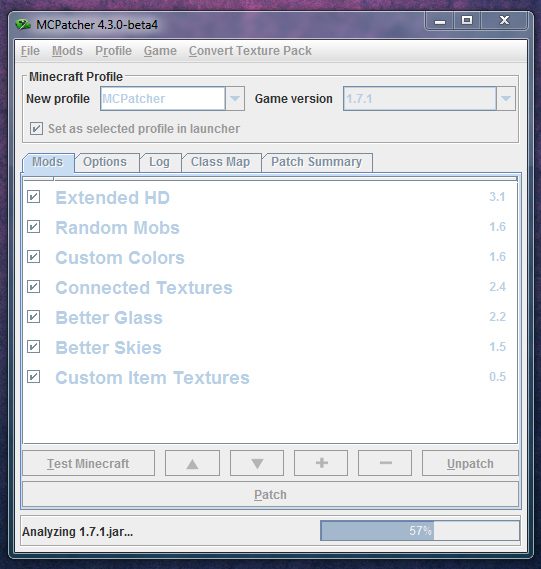 MCPatcher is a software designed by Java. In particular, it helps players install many features like converting texture, better glass and connected textures. You can easily customise resource packs like changing their colors or fonts. 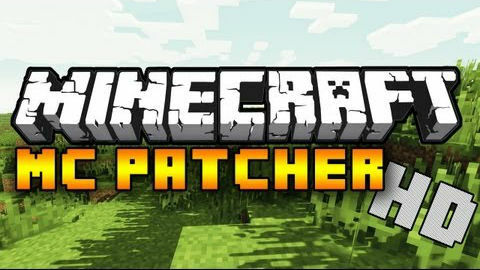 I think MCPatcher is the most up-to-date mod when new versions of Minecraft are released. Better Glass and ore transparency options for glass textures. Better Skies and add your own textures to the day and night skies. Many options are for fading and blending. Custom Colors Mod and texture pack authors can now customize many colors in the game including swamps and lighting. You can see Misa’s texture pack for examples. Ability to save and load mod profiles and switch between them easily and also organize your mods by the Minecraft version they go with. Then click ?Patch’ button, you don’t have to select any texture packs yet. Fixed extra render pass issues with forge. Fixed glass panes connecting incorrectly. Reset custom redstone colors when switching packs. Less strict checking of neighbor metadata for CTM. Updated for 1.7.5 / 14w08a. Fixed launcher incompatibility with Test Minecraft button. Replaced min/maxHeight properties with ?heights? in CTM and Random Mobs. Fixed useGlint=false not applying to armor models. Fixed conflict with Forge texture loading. Fixed problem rendering a custom compass in item frames. Various CTM and custom colormap fixes. Do not render top and bottom edges between connected glass panes. Use new URL for downloading libraries. Use gson 2.2.4 for older Minecraft versions. Handle newer Forge versions named ?forge’, not ?minecraftforge’. Updated for 1.7.4 and related launcher changes. Fixed bug causing attempts to download json files for modded versions. Fixed UI hang when user closes window while patcher is busy. Force consistent coloring between top and bottom halves of double_plant blocks. New CTM property linked=true to synchronize top and bottom halves of double_plant blocks when using random CTM. Apply default grass.png to tall ferns and grass too. Fixed CTM problems with metadata 15. Fixed custom grass, foliage.png always using the vanilla format. Fixed beacon particle effects transparency. Support texture. * syntax in CIT type=enchantment. Added yOffset property to grid format colormap. Fixed crash with zan’s minimap. Fixed transparency issues with 13w47e. Fixed CIT ignoring weight property in some cases. Allow CIT matching of damage as a % of max in addition to an absolute value. Preserve Mojang’s hard-coded biome colors for packs with no grass, foliage.png. Fix inconsistent water particle colors. Ignore neighbor’s metadata when checking connect=material. New property enableColormap.3 to enable custom colormaps during render pass 3. Fixed CTM iron bars applying default texture on top of custom one. Fixed conversion of texture packs from 1.4 to 1.5.